It’s so important to keep our skin feeling nourished and moisturised all year round, but at this time of year, we think it’s best to switch to thicker, richer products, as opposed to the lightness of the summer. We want to share with your our favourite products to keep your skin nice and hydrated! Let’s let it be said though, the best form of hydration for inside and out, is a miracle product – water! I don’t think you need us to tell you that there are sooo many health benefits to drinking plenty of water and youthful, hydrated skin is just one of them! I’m a big bath fan. I’m also a big Lush fan. In the colder months there’s nothing like lighting some candles and getting in a hot bath with an ice cold glass of water. I love the Lush bath oil melts. My favourite is Mmmelting Marshmallow Moment, it smells a-ma-zing. It also makes your bath water feel really silky and luxurious. Once I come out of the bath I pat dry, and use The Body Shop Piñata Colada body butter. It’s quite a summery fragrance, but I just love it. And because it’s a butter it really sinks into the skin. For tougher areas I can’t live without coconut oil. I put this on my ankles, knees and elbows. I could write a whole post on the stuff. Love it! On my face I apply my regular moisturiser which I tend to switch up, I’m yet to find one that makes me want to buy again… any suggestions welcome! Currently I’m using the Nivea Q10 Pore Refining Anti-Aging Day Moisturiser. I use the Soap & Glory eye cream, because unfortunately I’m at that age where I need to start thinking about these things! And it’s also nice to have a bit of extra protection against the cold. My lips couldn’t go without Elizabeth Arden Eight Hour Cream. It’s a staple. It can also be used all over your body so it’s great for travelling when you don’t want to carry too many things. I don’t do this all the time, but if I’m having a pamper night, I like to apply a foot cream and put on some big fluffy socks before bed. Zzzz…. My ultimate holy grail product for Winter is good old baby oil. I apply this all over quite liberally when I have just stepped out the shower and my skin is still dripping wet, then I just dry my skin as normal. Apparently applying it to wet skin locks in up to 10 times more moisture than an ordinary lotion can on dry skin. Boots have started doing a really affordable spray bottle which makes it even easier to apply. Once the baby oil has dried in, for an extra dose of hydration I use the Origins Ginger Souffle Whipped Body Cream. I initially got this as a free gift when I bought some other origins products but I loved it so much that I’m now on my 3rd tub! It dries in very quickly and doesn’t leave any sticky or greasy residue on the skin. If you don’t like overly sweet, girly scents, you will love this, it makes a nice change from the usual sickly sweet scents that I come across a lot. I have my eye on the Origins ginger body oil too – if you have tried it, please let me know your thoughts on it. Another Autumn/Winter favourite from Origins is the Drink Up Intensive Overnight Mask. I spoke about this in our Skincare Routine post and I can’t rave about it enough! 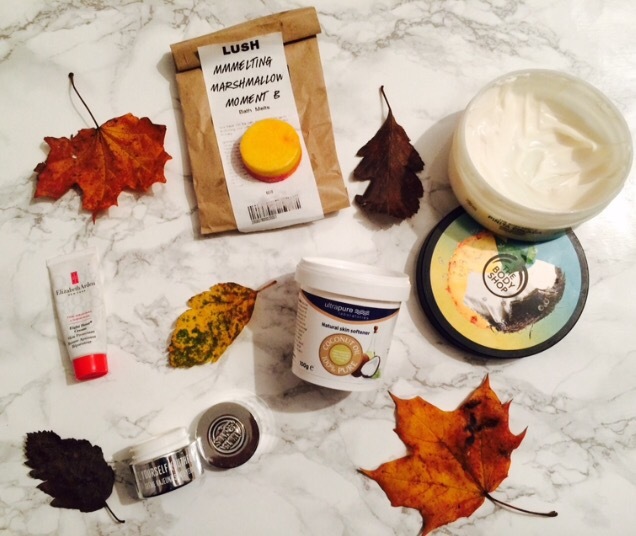 It is perfect for the cold months where my skin needs some extra hydration. I only use a small amount so it has lasted me ages and when I apply it at night I really notice a difference the next morning. I just massage it in to clean, dry skin before bed and wake up with smooth, hydrated skin. I’m a huge fan of The Body Shop, in particular their Hemp range. I find the products extremely hydrating and perfect for this time of year. 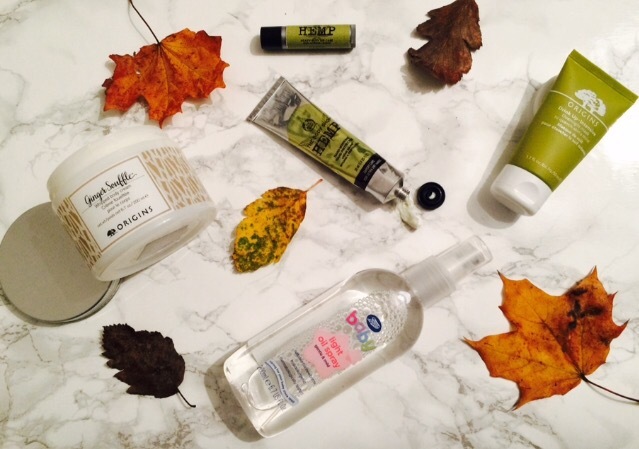 The hand cream is an Autumn/Winter essential for me. A couple of years ago my hands got really dry and cracked and were even bleeding at times, I tried various hand creams and this was the only one that helped them! I now wouldn’t use anything else. The smell isn’t amazing but it’s worth it for the difference it makes. To keep my lips hydrated, I can’t see past The Body Shop Hemp lip conditioner, especially at this time of year when my lips are prone to getting dry and cracked. I’ve tried various lip balms over the years and this one is definitely the best. If you’re a fan of a dark, matte lip at this time of year, this would be a great way to ensure your lips are smooth and lipstick ready! If you haven’t tried it I’d recommend you do! We hope you enjoyed this post. Please let us know if you’ve tried any of these products or if there is anything else you think we should try. We had a girls night out at the weekend so keep an eye out for a mini post on that!